The Bugatti Chiron—touted to be the world’s fastest car—provides the creative spark for the new ticker. The relationship between Parmigiani Fleurier and Bugatti is 13 years long. It’s believed to be the longest-standing partnership between a watchmaker and an automobile marque in the market. The alliance has spawned various creations like the Bugatti Type 370, Bugatti Super Sport and Bugatti Aerolithe. On Oct 24, Parmigiani unveiled the latest member of the family, the Bugatti Type 390, in Molshiem, France. (Molsheim is where the Bugatti headquarters is based at.) The watch takes inspiration from the Chiron—the French automaker’s latest thoroughbred—and is the brainchild of both the teams from Parmigiani and Bugatti. “From the beginning, we knew that we shared the same vision in terms of innovation, reliability and ethics. Inspired by the philosophy underpinning the development of the Bugatti Chiron, the Bugatti Type 390 and its extraordinary mechanical movement represent a new chapter in this dynamic partnership,” said Parmigiani president Michel Parmigiani. 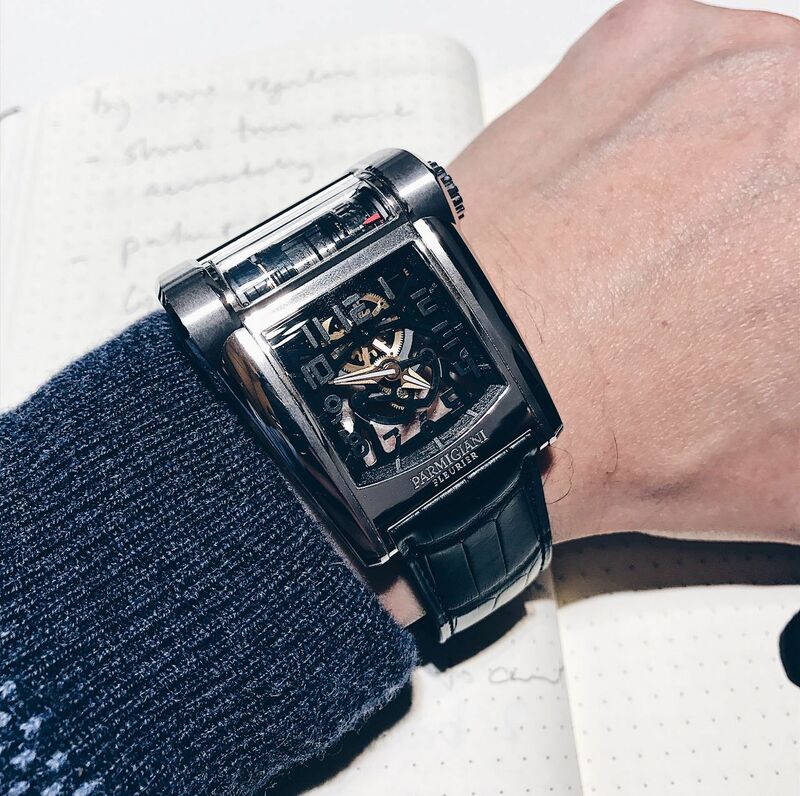 According to the watchmakers, who worked on the project, the watch was built from inside out. The team took creative reference from the 8-litre, 1500 horsepower, quad-turbocharged W16 engine of the Chiron, which comes in a mono block. After spending five years of research and development and collaboration with the Bugatti design team, the Calibre PF390 is born. It is a cylindrical manual-winding movement with a flying tourbillon. It boasts two barrels, which are mounted in series with a patented triangular barrel system—this gives the watch an impressive power reserve of 80 hours. The movement constantly references various aspects of the Bugatti Chiron. The linear power reserve indicator at the top right-hand corner of the watch, for instance, is designed with the fuel gauge in mind. Ditto the flying tourbillon, which references the power regulator in the supercar. At the launch event attended by VIPs and media from around the world, Wolfgang Dürheimer, Bugatti’s president, acknowledged the collaborative nature of the partnership with Parmigiani. “Like all Bugatti supersport cars, Parmigiani Fleurier watches are designed in pursuit of excellence and the ultimate performance,” he said. “A horological interpretation of our Bugatti Chiron, the Bugatti Type 390, with its extraordinary engine block and unique exterior, appears to be the product of identical ambitions". The first versions of the Bugatti Type 390 come in either rose or white gold with 10 pieces each. They are also due to be delivered to their respective owners in the next couple of weeks. Parmigiani Fleurier is exclusively available at The Hour Glass.